The barnacle goose (Branta leucopsis) is a black goose belonging to the family of ducks and swans, the Anatidae. 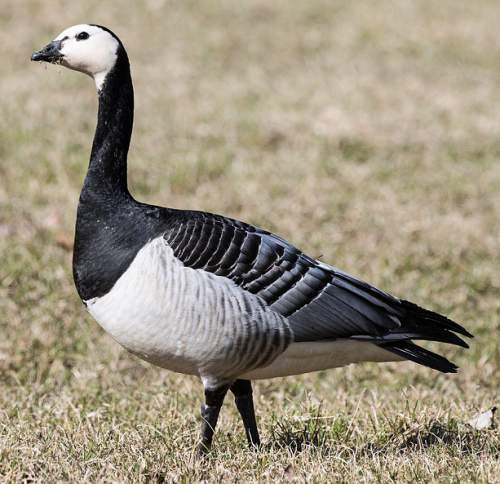 The barnacle goose is distributed in north and west Europe and Greenland. Vagrants of this goose species are observed in Canada and USA. This goose species is monotypic. The barnacle goose (Branta leucopsis) is a medium-sized goose measuring 60 to 70 cm in length and weighing 1300 to 2200 grams. The wingspan is 130 to 145 cm. The barnacle goose has white, face, fore-crown, forehead and throat. The nape, hinderneck, back, tail and breast are black. The underparts are whitish. The wings are blackish gray with white bands. There are fine blackish bands on the flanks. The bill is short and blackish. The irises are blackish. The legs and feet are dark gray. Their call is a short, sharp, barking "quak..quak" sound. 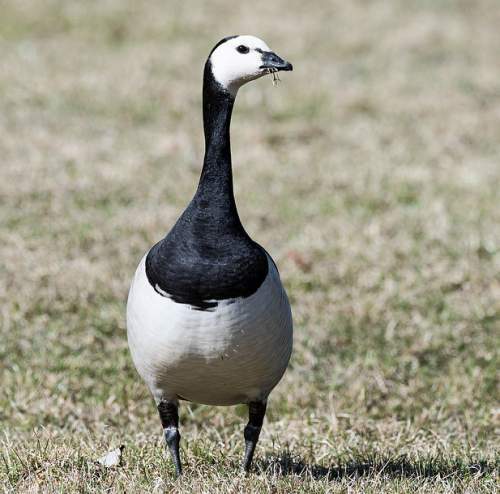 The breeding barnacle goose populations are distributed in Greenland (Denmark), Iceland, Svalbard and Jan Mayen Islands (Norway), Norway, Sweden, Finland, Estonia, Latvia and Northwest Arctic Russia. The wintering goose populations are found in Ireland, United Kingdom, Netherlands, Belgium, France, Germany, west Denmark and southern Norway. Vagrant goose is seen in Canada, United States, Switzerland, Spain, Portugal, Italy, Turkey Hungary, Austria, Serbia, Algeria, Morocco, Egypt and Tunisia. The Important Bird and Biodiversity Areas (IBA) of the barnacle goose species in Iceland are, Svarfadardalur, Hóp-Vatnsdalur and Hestgerdislón-Hornafjardarfljót. The IBA in Germany is Jadebusen. The IBA of the barnacle goose in Greenland are, Germania land, Enhjørningens Dal, Pingel Dal, Kjoveland, Heden, Hochstetter Forland, Ørsted Dal, Østersletten and Knudshoved and and Slaedelandet. Some of the IBA of this barnacle goose in United Kingdom are, Upper Solway Flats, Uists Machairs, Tiree and Coll, South Walls, Shiant Isles, Rinns of Islay, Monach Islands, Loch of Strathbeg and Lindisfarne. The barnacle goose species does not normally occur in forest. It normally occur in altitudes from 0 to 100 meters. The artificial ecosystems and habitats of the goose species include the pasturelands. The natural ecosystems and habitats of the goose species include Arctic semi-desert tundra, tundra grasslands, marine mudflats, intertidal rocky shores, intertidal marshes with emergent grasses and tidepools. The diet of this barnacle goose species consists mainly of plant matter. Grasses, sedges, leaves, stems, seeds, aquatic plants (del Hoyo et al. 1992), agricultural grain and vegetables are their primary food. The breeding season of the barnacle goose species is from May to July in most of their breeding range. These species are monogamous and pair for life. They breed in small dense colonies. The nesting sites include rocky ground (del Hoyo et al. 1992), rocky outcrops, steep cliffs and tops of low hills. The nest is shallow depression on a mound of vegetation. The clutch contains 4-6 eggs. The female bird incubates the eggs. The chicks hatch out after 24-26 days. The hatchlings are precocial and leave the nest and feed themselves. The chicks fledge after 40 to 45 days. The young are protected by the parents. The barnacle goose species is a fully migratory bird. The breeding populations occurring in Arctic islands migrate southwards to the wintering grounds in September. The winter is spent in the coastal areas of west Europe. The return migration begins in April. The barnacle goose species spends about 30 days in spring staging areas for feeding, before migrating to the breeding grounds. The global population size of the barnacle goose (Branta leucopsis) is estimated at about 880,000 individual birds. The overall population trend of the species is considered to be increasing. In most of its range, this species is reported as common. The generation length is 10.5 years. Its distribution size is about 5,950,000 sq.km. Habitat alteration, fragmentation and destruction and hunting are the main threats that are endangering the survival of this goose species. 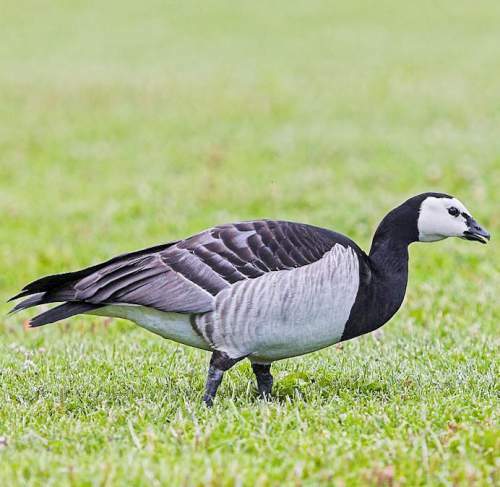 The barnacle goose (Branta leucopsis) does not approach the thresholds for being Vulnerable either under the range size criterion, or under the population trend criterion or under the population size criterion. The IUCN (International Union for Conservation of Nature) has categorized and evaluated the goose species and has listed it as of "Least Concern". The CITES (Convention on International Trade in Endangered Species of Wild Fauna and Flora) status is ‘Not Evaluated’ for the barnacle goose (Branta leucopsis). The barnacle goose (Branta leucopsis) is closely related to the brent goose (Branta bernicla). Current topic on Birds of North America: Barnacle goose - Branta leucopsis.